Amazon Exclusive Essay: Daniel Silva on Gabriel Allon and the "Accidental Series"
Writers tend to be solitary creatures. We toil alone for months on end, then, once a year, we emerge from our dens to publish a book. It can be a daunting experience, especially for someone like me, who is not gregarious and outgoing by nature. But there is one aspect of promotion I truly love: meeting my readers and answering their questions. During each stop on my book tour, I reserve the bulk of my time for a lively conversation with the audience. I learn much from these encounters-indeed, some of the comments are so insightful they take my breath away. There is one question I am asked each night without fail, and it remains my favorite: "How in the world did you ever think of Gabriel Allon?" The answer is complicated. In one sense, he was the result of a long, character-construction process. In another, he was a bolt from the blue. I'll try to explain. In 1999, after publishing The Marching Season, the second book in the Michael Osbourne series, I decided it was time for a change. We were nearing the end of the Clinton administration, and the president was about to embark on a last-ditch effort to bring peace to the Middle East. I had the broad outlines of a story in mind: a retired Israeli assassin is summoned from retirement to track down a Palestinian terrorist bent on destroying the Oslo peace process. I thought long and hard before giving the Israeli a name. I wanted it to be biblical, like my own, and to be heavy with symbolism. I finally decided to name him after the archangel Gabriel. As for his family name, I chose something short and simple: Allon, which means "oak tree" in Hebrew. I liked the image it conveyed. Gabriel Allon: God's angel of vengeance, solid as an oak. Gabriel's professional r�sum�-the operations he had carried out-came quickly. But what about his other side? What did he like to do in his spare time? What was his cover? I knew I wanted something distinct. Something memorable. Something that would, in many respects, be the dominant attribute of his character. I spent many frustrating days mulling over and rejecting possibilities. Then, while walking along one of Georgetown's famous redbrick sidewalks, my wife, Jamie, reminded me that we had a dinner date that evening at the home of David Bull, a man regarded as one of the finest art restorers in the world. I stopped dead in my tracks and raised my hands toward the heavens. Gabriel Allon was complete. He was going to be an art restorer, and a very good one at that. Over my objections, the book was entitled The Kill Artist and it would go on to become a New York Times bestseller. It was not, however, supposed to be the first book in a long-running series. But once again, fate intervened. In 2000, after moving to G.P. Putnam & Sons, my new publishers asked me what I was working on. When I mumbled something about having whittled it down to two or three options, they offered their first piece of advice. They really didn't care what it was about, they just wanted one thing: Gabriel Allon. I then spent the next several minutes listing all the reasons why Gabriel, now regarded as one of the most compelling and successful continuing characters in the mystery-thriller genre, should never appear in a second book. I had conceived him as a "one off" character, meaning he would be featured in one story and then ride into the sunset. I also thought he was too melancholy and withdrawn to build a series around, and, at nearly fifty years of age, perhaps a bit too old as well. My biggest concern, however, had to do with his nationality and religion. I thought there was far too much opposition to Israel in the world-and far too much raw anti-Semitism-for an Israeli continuing character ever to be successful in the long term. My new publishers thought otherwise, and told me so. Because Gabriel lived in Europe and could pass as German or Italian, they believed he came across as more "international" than Israeli. But what they really liked was Gabriel's other job: art restoration. They found the two opposing sides of his character-destroyer and healer-fascinating. What's more, they believed he would stand alone on the literary landscape. There were lots of CIA officers running around saving the world, they argued, but no former Israeli assassins who spent their spare time restoring Bellini altarpieces. The more they talked, the more I could see their point. I told them I had an idea for a story involving Nazi art looting during the Second World War and the scandalous activities of Swiss banks. "Write it with Gabriel Allon," they said, "and we promise it will be your biggest-selling book yet." Eventually, the book would be called The English Assassin, and, just as Putnam predicted, it sold twice as many copies as its predecessor. Oddly enough, when it came time to write the next book, I still wasn't convinced it should be another Gabriel novel. Though it seems difficult to imagine now, I actually conceived the plot of The Confessor without him in mind. Fortunately, my editor, Neil Nyren, saved me from myself. The book landed at #5 on the New York Times bestseller list and received some of the warmest reviews of my career. After that, a series was truly born. I am often asked whether it is necessary to read the novels in sequence. The answer is no, but it probably doesn't hurt, either. For the record, the order of publication is The Kill Artist, The English Assassin, The Confessor, A Death in Vienna, Prince of Fire, The Messenger, The Secret Servant, and Moscow Rules, my first #1 New York Times bestseller. 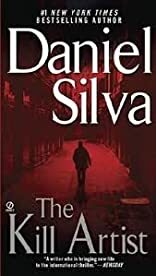 The Defector pits Gabriel in a final, dramatic confrontation with the Russian oligarch and arms dealer Ivan Kharkov, and I have been told it far surpasses anything that has come before it in the series. And to think that, if I'd had my way, only one Gabriel Allon book would have been written. I remain convinced, however, that had I set out in the beginning to create him as a continuing character, I would surely have failed. I have always believed in the power of serendipity. Art, like life, rarely goes according to plan. Gabriel Allon is proof of that.